A very nice trip writeup for our database by Frank Kriewaldt has been posted here: http://www.myccr.com/canoeroutes/queen- ... rness-park. 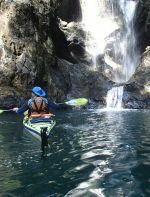 Although this is not a long trip, the writeup is very helpful to paddlers who might be interested in this trip. It includes the general trip info, a downloadable GPS track which our software displays as a Google map, photos & a map. In addition, relevant information is all included in the writeup. It is not as helpful when there is a link that takes you away from our site to another site - because fairly regularly, circumstances change & the links become dead. It is far better to include all relevant information right here in our database.